Colostrum is the first milk a mammal produces for her newborn, and it has several important immune properties. Many people take a colostrum supplement to boost their immune health and promote a healthy and balanced digestive tract. 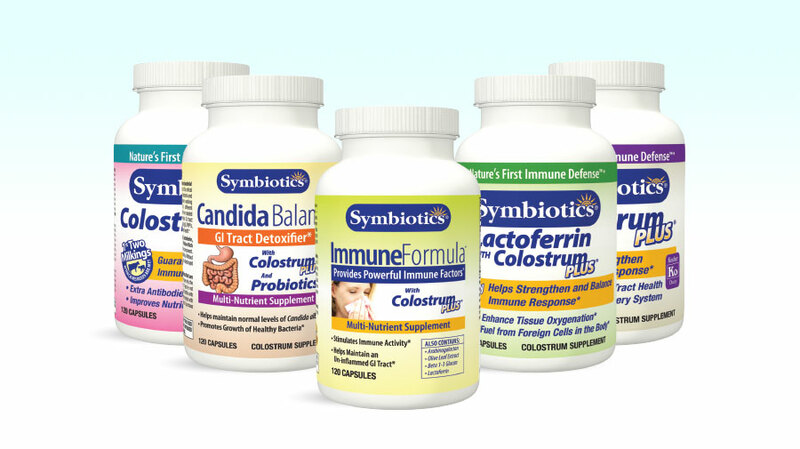 Symbiotics Colostrum Plus Candida Formula: This is good for people who have imbalanced digestive flora due to a diet with overly processed foods and high fat. Candida albicans can cause a yeast infection when too much is present. This supplement has Candida Balance™, a formula with lactoferrin, probiotics and colostrum to reduce candida and restore the balance of flora in the gut. Symbiotics Colostrum Plus Arthro Formula: Aside from boosting the immune system and balancing the digestive tract, this formula has MSM, glucosamine sulfate, lipase and cetyl myristoleate to promote joint and bone health. Symbiotics Colostrum 40% High-IG: These capsules contain high levels of immunoglobulin content and give an extra boost to the immune system for athletes and others whose bodies are under physical duress.